LA JOLLA—Rapid advances in the ability to grow cells, tissues and organs of one species within an organism of a different species offer an unprecedented opportunity for tackling longstanding scientific mysteries and addressing pressing human health problems, particularly the need for transplantable organs and tissues. In a tour de force paper published in the January 26, 2017, issue of the journal Cell, scientists at the Salk Institute report breakthroughs on multiple fronts in the race to integrate stem cells from one species into the early-stage development of another. Combining cutting-edge gene-editing and stem-cell technologies, the scientists were able to grow a rat pancreas, heart and eyes in a developing mouse, providing proof-of-concept that functional organs from one species can be grown in another. They were also able to generate human cells and tissues in early-stage pig and cattle embryos, marking the first step toward the generation of transplantable human organs using large animals whose organ size, physiology and anatomy are similar to humans’. Scientists found, however, that fully integrating cells from divergent species might prove more difficult than combining cells from rats and mice—which are closer evolutionary relatives. 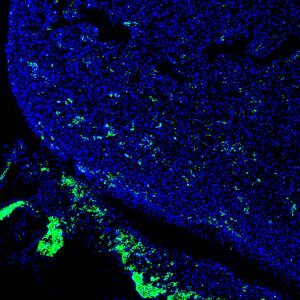 Cells derived from rat pluripotent stem cells (PSCs) were enriched in the developing heart of a genetically modified mouse embryo. An interspecies chimera is an organism containing cells from different species. The word “chimera” originally described mythological creatures or deities in polytheistic religions. In science, interspecies chimeras have emerged as valuable basic research tools with potential for future clinical applications. In a study published in 2015 in Nature, Izpisua Belmonte’s team reported the first successful attempt to fully integrate human pluripotent stem cells into nonviable mouse embryos, so that the human cells began to develop into very early-stage tissues. Scientists have long hoped to use stem cells to grow replacement organs for patients in the laboratory, but this has proven challenging because of the complexity of recreating an animal’s physiology from scratch. The earlier Salk study opened the door to a new alternative: using an animal chimera host to grow human tissues and organs. 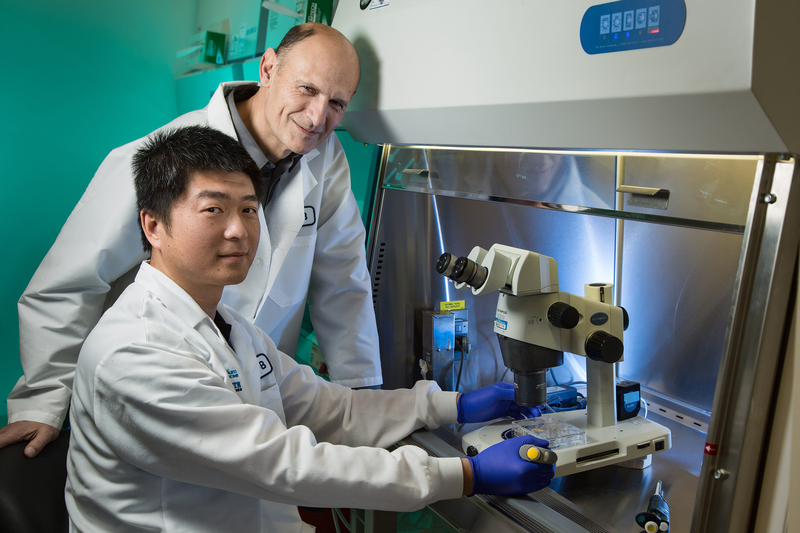 The research also opened a new window into the early-stage development of humans and animals, offering a novel way to study the complex developmental programs that orchestrate how cells form the many tissues and organs of the body. The new Cell paper reports how the Izpisua Belmonte team expanded on that earlier work, detailing the variety of experiments the Belmonte lab undertook to advance the technology. 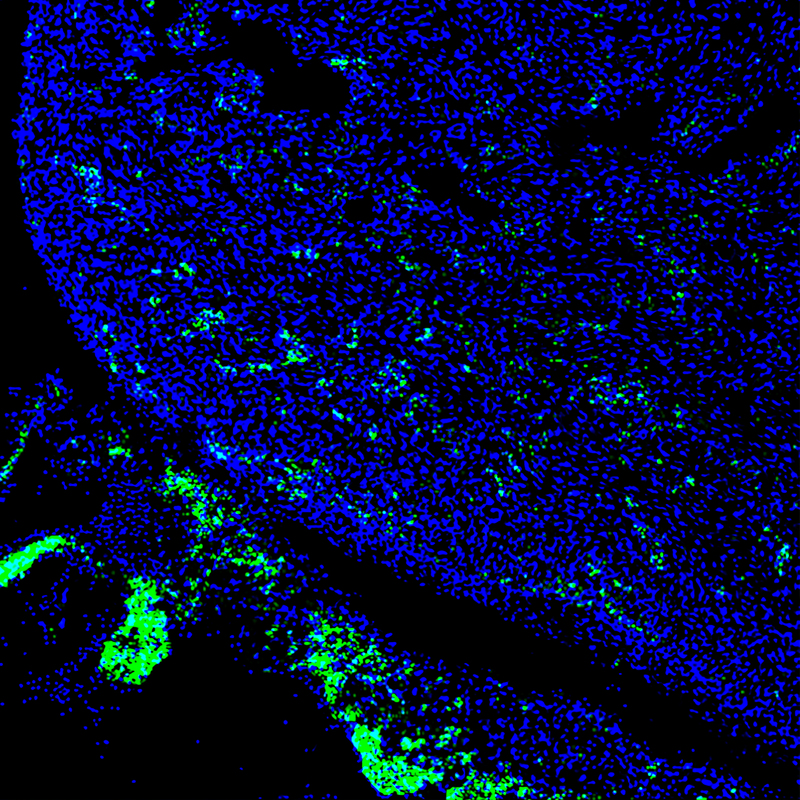 Human iPS cells (green) contributed to a developing heart of 4-week-old pig embryo. In one experiment, they used the gene-editing technology known as CRISPR-Cas9 on mouse embryos to turn off the gene that makes the pancreas. They then inserted rat pluripotent stem cells, which contained an intact pancreas gene, into each mouse embryo. Once implanted in surrogate mouse mothers, the embryos developed normally—except for the fact that each mouse was growing a rat pancreas. This success led the team to try growing other rat organs in mice, including eyes and heart. It is not practical to grow human organs in mice or rats, however, because rodents are simply too small and developmentally different. So in other experiments, the team turned to pigs, whose organ sizes and developmental timescales are more comparable to ours. After generating several different types of human induced pluripotent stem (iPS) cells, the scientists inserted the most promising types into pig embryos and successfully implanted sows with those embryos. The researchers stopped the experiment at four weeks in order to evaluate the technology’s safety and effectiveness to that point. Some embryos showed that the human cells within were beginning to specialize and turn into tissue precursors, though the success rate and level of human iPS cell contributions in pigs were much lower than for mouse embryos containing rat cells. The results represent the first successful attempt of integrating human iPS cells into a large-animal species, and may yield insights into how human diseases begin and progress as well as provide a new platform for drug toxicity tests. The scientists underscore that the research is still in very early stages and significant challenges remain to developing medical therapies based on the technology. “Of course, the ultimate goal of chimeric research is to learn whether we can use stem-cell and gene-editing technologies to generate genetically-matched human tissues and organs, and we are very optimistic that continued work will lead to eventual success,” says Izpisua Belmonte. “But in the process we are gaining a better understanding of species evolution as well as human embryogenesis and disease that is difficult to get in other ways. Future work will involve continuing to understand the limits to getting human cells to incorporate successfully into animals. Other authors included: Aida Platero Luengo, Masahiro Sakurai, Atsushi Sugawara, Takayoshi Yamauchi, Keiichiro Suzuki, Mariana Morales Valencia, Daiji Okumura, Jingping Luo, Tomoaki Hishida, Emi Suzuki, Paloma Martinez-Redondo, Alejandro Ocampo, Pradeep Reddy, Concepcion Rodriguez Esteban and W. Travis Berggren of the Salk Institute; Maria Antonia Gil, Cristina Cuello, Inmaculada Parrilla, Cristina A. Martinez, Alicia Nohalez, Jordi Roca and Emilio A. Martinez of the University of Murcia Campus de Espinardo; Yanina Soledad Bogliotti, Marcela Vilarino, Delia Soto, Huili Wang, Elizabeth A. Maga and Pablo Juan Ross of the University of California, Davis; Llanos Martinez, Sonia Sanchez, Estrella Nuñez and Jeronimo Lajara of the Universidad Católica San Antonio de Murcia; Isabel Guillen and Pedro Guillen of Clinica Centro Fundación Pedro Guillén; and Josep M. Campistol of the Hospital Clinic of Barcelona. The work was funded by The Fundación Séneca; a University of California, Davis, Academic Senate New Research Grant; the Universidad Católica San Antonio de Murcia; Fundacion Dr. Pedro Guillen; the G. Harold and Leila Y. Mathers Charitable Foundation; and The Moxie Foundation.